Photo Booth Stand - Birmingham. Photo Booths 4Events in Birmingham are now hiring a Photo Stand, as well as our traditional Photo Booth.. 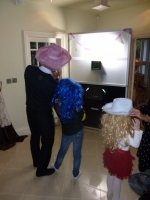 Unlike the traditional photo booth, you pose in front of a free-standing photo stand, meaning all of the guests at your party can join in with the fun of seeing you don hats, wigs and glasses. It also means that rather than have a curtain or green screen image as the back drop to your photos, you will have your party instead. The Photo Stand is ideal for house parties and other smaller venues, since it takes up much less room that the traditional photo booth.